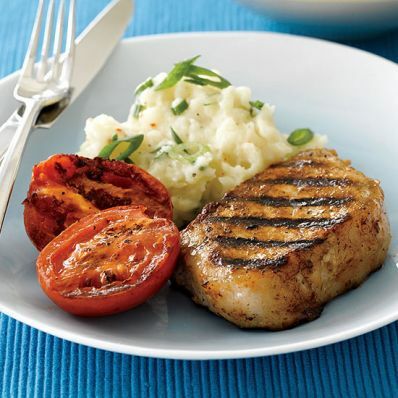 1 of 4 Marinate pork chops in 1/2 cup of the vinaigrette for 20 minutes. Heat grill to medium-high/medium-hot coals. 2 of 4 Remove pork from marinade and pat dry. Season with 1 teaspoon of the Montreal seasoning, 1/4 teaspoon of the salt and 1/4 teaspoon of the pepper. 3 of 4 In bowl, toss tomatoes and remaining 2 tablespoons dressing. Place potato in large glass bowl. Add remaining Montreal seasoning and milk. Cover with plastic wrap, venting one side. Microwave for 3 minutes on HIGH. Uncover and mash. Stir in butter, remaining 1/2 teaspoon salt, 1/4 teaspoon pepper and the scallions. Re-cover bowl; microwave 3 minutes. 4 of 4 Meanwhile, grill pork chops and tomatoes for 4 minutes. Carefully turn over; brush tomatoes with any dressing from bowl. Grill 3 more minutes, until pork registers 150 degrees F on an instant-read thermometer. Serve warm.